It is with great sadness and heavy hearts that we share with you the news that the AJC is reporting that Larry Munson has passed away. Munson was 89 years old. I remember the first time I heard Munson. My family wasn't Dawg fans at the time, but we were living in Thomaston, Ga. I was about 10 years old, and we were listening to the 1982 Georgia at Auburn game. It just happened to be on in the background. Late in the fourth quarter, Munson started begging the Georgia Defense to "just hunker it down one more time." My mom came into the room and said, "Who is this guy?" I replied, "I don't know, but he's nuts, and it's great." You won't hear a call like that today. No announcer wants to beg, pray or plead for a defensive stand. They say it's not "professional." In reality, they can't do it. It wouldn't be genuine because they don't love the team they are calling the way Larry loved Georgia. We'll all miss him. He was the best there ever was or ever will be. Rest in Peace Larry. While we're waiting on the various obits, I thought I'd share some articles about Larry's retirement that were really exceptional. It goes without saying that I'm wearing black to the game Saturday. Also, check out LarryMunson.com for some great old clips. What's your favorite Munson memory? Please feel free to share in the comments. I'm not going to the Tech game but I may have to adjust my gameday attire as well. 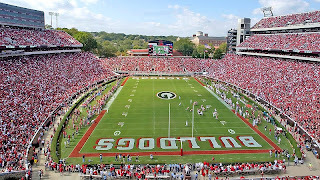 It's too bad that we won't get a retrospective at Sanford Stadium until next season. You think they'll do something at the SEC Championship game? I am honored to have the same birthday as Larry Munson, just 56 years apart. One of my greatest Georgia football memories was the Sept 28, 2002 game at Sanford Stadium. Every Dawg in attendance sang happy birthday to Munson and me...they just didn't know they were singing to me. Having spent many near birthday Saturdays in Sandford Stadium, it was special to have this one day to celebrate with Larry. Although my family and I tried to connect with Larry, I never got to meet him, but this day and the gift of his calls were special. Munson left me with many memories that will last a lifetime. My first Georgia/GT game was 2006. It was already special, but Larry's TOUCHDOWN! TOUCHDOWN! TOUCHDOWN! TOUCHDOWN!!! MASSAQUOI! made it extra special. I think that was his last great, stylized call before retirement.